This is a total BRAG log today! I am so pleased- I logged into the campus website and found out I got an A in all of my classes this semester! Yay! GPA is 3.89 because I had one B+ in there from last semester. Grrr...oh well, whatcha gonna do? I only ranted about that for a little while- after all, I am a grownup now- or cleverly disguised as one. 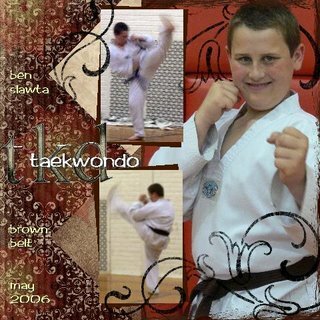 But the thing I am most thrilled about that I had to post here is that My 11yo son Ben earned his Brown Belt in TaeKwonDo last night! WooHoo Ben This is not a scaled down belt for kidders, but he has to go through the same tests and learn the same forms as the adults, and spars with adults! He is awesome and has worked sooo hard to get here! We were on the same level until this last semester when I stopped because I was just too busy with school, but he kept going, and pushed though! Ben- you Rock, Baby! congrats!!!!!!!! to both of you!